Progressive Commerce provides a wide array of brand building services designed to help your business get noticed on and beyond the web. FrontRunner sm is an innovative real-time Internet interface that provides existing and new e-commerce stores and web developers with up-to-the-second access to all the back-end operations that significantly enhance your e-commerce effectiveness. 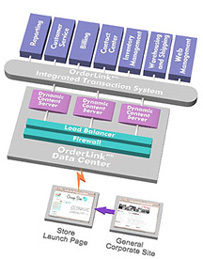 As an integrated component of OrderLink® services, it is a robust - yet easy to use - programming interface that allows real-time access to inventory, order information and shipment tracking data. It tightly integrates Web sales channels with customer service and fulfillment processes. In addition, order confirmation and inventory allocation is made in real-time, assuring your customers of accurate responses at the time of order placement. FrontRunner sm also allows seamless integration between web stores and traditional direct response offers. Promotion tracking, inventory usage, credit processing and accounting can now blend into a cohesive marketing effort.